"I'm freaking out. I hallucinate. I didn't think so many people would come, especially in this weather," Itziar exclaims, pointing to the sky, covered with dark clouds. Itziar accompanies her mother, a 70-year-old pensioner, and is carrying her son, who is only a few months old. "I have come to protest because it touches me deeply — my 'aitas' (parents in Basque) are both pensioners — and also for me and the future," she says, smiling as she points to her son, who is asleep in a backpack next to her chest. Since 2013, the pension revaluation rate in Spain has remained at 0.25%. In 2015 and 2016, the Consumer Price Index (CPI) was the same. However, in the last two years, the CPI has exceeded 1%, and pensioners have been losing purchasing power. On every Monday since January, pensioners in Bilbao have gathered in front of the town hall to ask that their pensions be increased to the same level as the CPI. National media have compared the silver protests to the younger, anti-austerity Indignados movement. The campaign was led by Spanish youth on social media in 2011. It began as demonstrations across the country and resulted in the formation of the anti-establishment political party Podemos (now ruling Madrid and Barcelona's mayors). The demonstration was predicted to be crowded. Thousands of people waited in front of the town hall for almost an hour before it began. Even the metro did not reach stations in the old town, close to the starting point, because transport lines had been blocked, according to public announcements. "We've been protesting for weeks about the same thing," says Fermín, a native of Malaga in the south of the country, who has lived in Bilbao since the 1970s. "It's outrageous that after a lifetime of hard work, they now want to take away the four crumbs they give us," he adds angrily. "And for women it's worse. When their husbands die, if they have not contributed because they have worked in the black, they barely have a pension left to survive. It's unfair." With shouts like"We're going to win this battle" or "Pentsionistak aurrera!" (pensioners ahead, in Basque) tens of thousands of people, more than 100,000 according to figures from the municipal police and the town council, were marching amidst heavy rain. It was one of the biggest demonstrations the city had ever experienced. 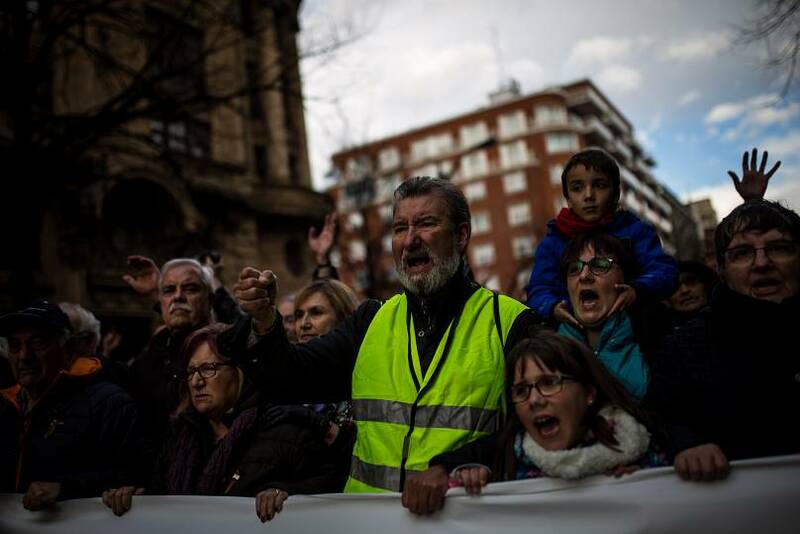 During the march, protesters yelled slogans against the government of Mariano Rajoy and signs alluding to institutional corruption were seen. Pili and Rosi have come together from Sopuerta, a district far from Bilbao's city center: "We don't have the 0.25% increase at all. Electricity, gas, shopping... everything goes up but our pension. I love it when young people come out to protest. This is everyone's business, young and old. Young people need to get involved," she says, pointing to a group of young people demonstrating with them. "I'm excited to see young people with us and the older ones." The straw that broke the camel's back. 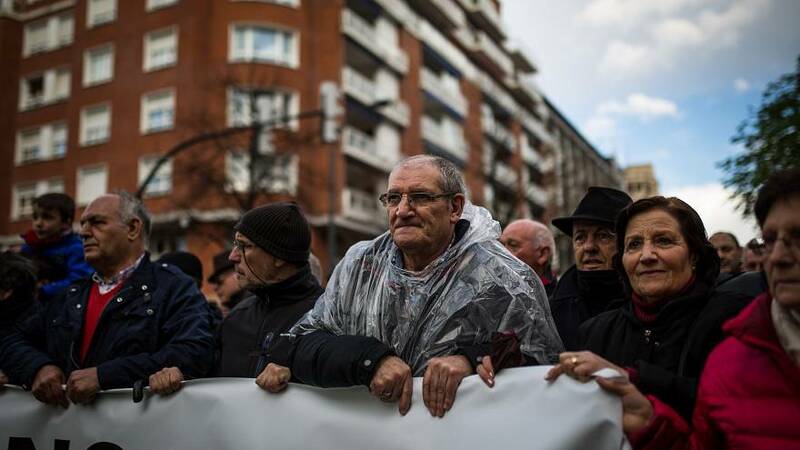 After weeks of mobilisations, retirees and pensioners — supported by people of all ages — have returned to the streets in the main cities of Spain and called for more than 150 demonstrations to demand government assurance about the future of pensions and for a proportional increase. The first gatherings began a few weeks ago, after a statement by Spanish President Mariano Rajoy, in which he called on retirees and future pensioners to start putting their money in private pension funds, thus calling into question the future and sustainability of the public pension system. 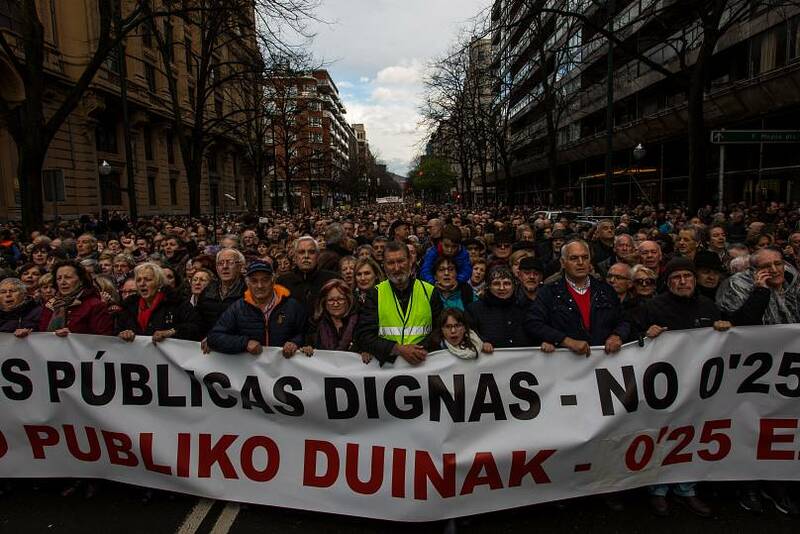 Demonstrations in the Basque city barely surpassed hundreds of people at the beginning of the year. But following Rojay's comments, attendance has soared to almost 40,000 — the same number that shut down Bilbao on March 22 last year. "It's a shame what the politicians are doing to us. We have thieves in the government. They have rescued motorways, banks, robbed everything they wanted, and now they say there is no money for pensions. ", says a raging Manuel. It's the first time the 52-year-old he has attended a demonstration in support of pensioners, but he insists that he will attend more meetings. "We are the people, and we go without flags and political signs." With the exception of a few "ikurriñas" (Basque flags) and a few isolated flags of the Second Spanish Republic, barely any political signs were seen during the course of the demonstration. Although the final reading of the manifesto has been over for a while now, people are still coming to the main square. Lorena, a student from Bilbao, is one of them: "I believe that this is not just an old people's struggle, I believe that the issue of pensions concerns us all. I had already come one Monday to protest, and I think that if there is any way this can change, it has to be so, by mobilising us."